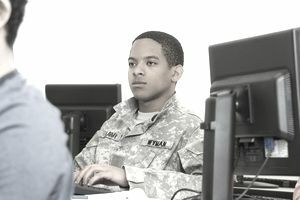 The Post-9/11 GI Bill gives education benefits to military members (including active duty, Reserves, and National Guard), who have at least 90 days of active duty service after September 11, 2001. The program, commonly referred to as the "GI Bill for the 21st Century," offers substantial increases in monthly education benefits over the previous GI Bill. It went into effect on August 1, 2009, and includes provisions to pay full tuition, $1,000 per year for books and supplies, and a monthly housing stipend. To be eligible for the program, you must have served a total of at least 90 days on active duty, after 9/11. If you have a total of six months or more of post-9/11 active duty service, time does not have to be continuous. Active duty service, for the purpose of this new bill, doesn't count active duty time spent in initial entry training (IET), meaning time in basic training, initial job training, service academies, OCS/OTS, and ROTC. Under the previous Montgomery GI Bill (MGIB), officers who received their commission through a service academy or an ROTC scholarship were ineligible. There are no such restrictions under the Post-9/11 GI Bill program. Any officer who was previously ineligible will be eligible for this program, assuming they have at least 90 days of post-9/11 active duty service. Similarly, military members who previously declined the MGIB are eligible for the Post-9/11 GI Bill program. The rate depends on the length of your post-9/11 active duty service, your state of residence, and the number of courses you take. Like the MGIB, the Post-9/11 GI Bill pays 36 months of full-time education benefits. So, if you go to school full time, you'll receive the full benefit rates for 36 months. If you go to school half-time, you'll receive half of your monthly entitlement for 72 months, etc. The Post-9/11 GI Bill pays up to 100 percent of the full tuition rate set by your state. Additionally, you will receive $1,000 per year for books and supplies, and you will receive a housing stipend equal to the Housing Allowance for an E-5 with Dependents, which varies with where you live. 100% - 30 or more consecutive days with a disability-related discharge. *Note: Post-9/11 active duty service of 24 or more months includes IET active duty service (basic training and job training) for enlisted members. When computing active duty time for enlisted who have less than 24 months of post-9/11 active duty service, time in IET doesn't count. For officers, time spent in the service academies, ROTC, and OTS/OCS doesn't count. Your tuition is paid directly to the school, while the book/supply entitlement and monthly housing allowance are paid directly to you. Veterans who are attending school through distance learning, and those going to school half time or less, do not receive the housing allowance. Additionally, military members who use the benefit while still on active duty do not receive the housing allowance, as their housing needs are already being taken care of by the military. Unlike the MGIB and VEAP, the Post-9/11 GI Bill does not require you to elect, decline, or make monthly contributions. Unfortunately, if you've already contributed to your GI Bill, you won't get your money back unless you use all of your new GI Bill entitlements. If you do, your $1,200 contribution to the MGIB (or a proportional amount, if you used any of your MGIB entitlement) will be added to your final new GI Bill education payment. If you're eligible for a "kicker," such as the Army or Navy College Fund, or a Reserve "Kicker," you will still receive the extra monthly benefit under the Post-9/11 GI Bill. This monthly amount will be paid to you, not to the university. Individuals who were previously ineligible for the MGIB because they elected the College Loan Repayment Program (CLRP) are eligible for the Post-9/11 GI Bill, but only active duty service performed after their initial active duty service obligation count toward the new benefits. In other words, if you initially enlisted for five years and received the CLRP, you would have to reenlist or extend your enlistment in order to take advantage of the new GI Bill. The Post-9/11 GI Bill allows a member to transfer part or all of his/her education benefits to a spouse or child(ren). To be eligible, a member must have at least six years of active duty or active reserve service and agree to serve for an additional four years. The MGIB expires 10 years after your last discharge. The new GI Bill extends this by five years. The benefits expire 15 years after your last discharge.